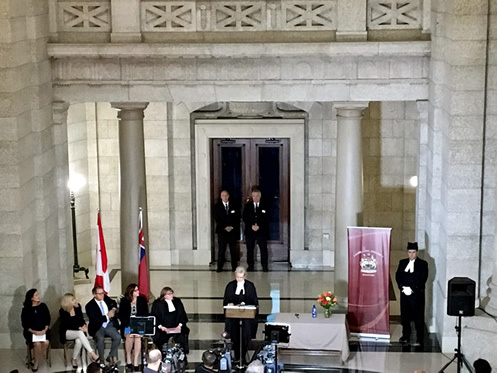 After a summer of construction and extensive consultation with an Accessibility Advisory Committee, the historic Manitoba Legislative Building’s chamber is re-opening today with a greatly increased level of accessibility. 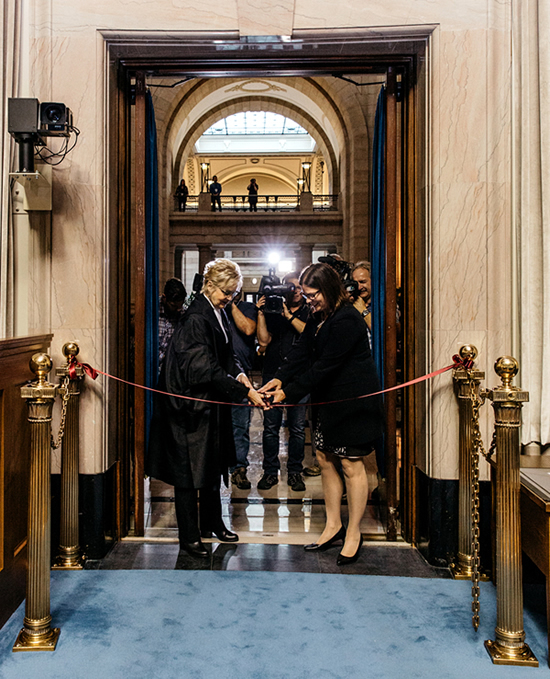 Speaker Myrna Driedger presided over the official re-opening at a formal ribbon cutting in the Rotunda followed by a visit to the newly renovated chamber. 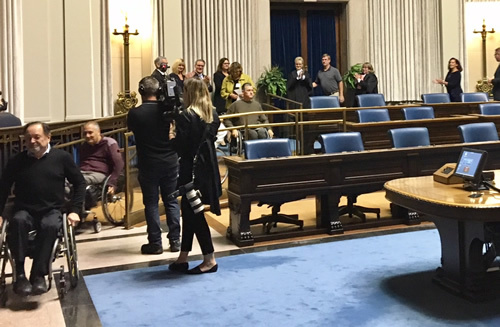 In its first legislative session in May 2016, the newly elected government introduced a dramatic change to the then 96-year-old chamber when six MLA desks were made accessible to accommodate members with mobility issues. 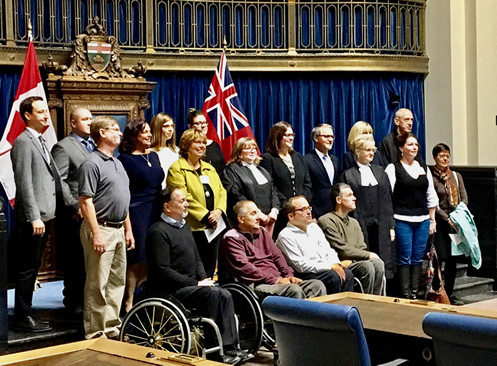 Now, with the reconvening of the 41st legislature on Oct. 4, all MLA desks in the first and third rows will be accessible, along with the Speaker’s platform. The work was guided by an Accessibility Advisory Committee comprised of 24 members from the community, Legislative Assembly and government. Their task was to design an accessibility plan that maintained the horseshoe-shaped layout of the members’ desks in the chamber, a design that is unique among legislatures in Canada. The plan included raising the entire chamber floor 2.5 feet, moving the first-row desks forward to allow wheelchair access between them and the second row, installing a ramp on the Opposition side of the house and encapsulating the original marble floor under the new floor, making the change reversible, a criteria of any historic conservation project. In addition, the Speaker’s platform was raised to be flush with the entrance level, creating barrier-free access to the Speaker’s chair and the area behind the Speaker’s platform. 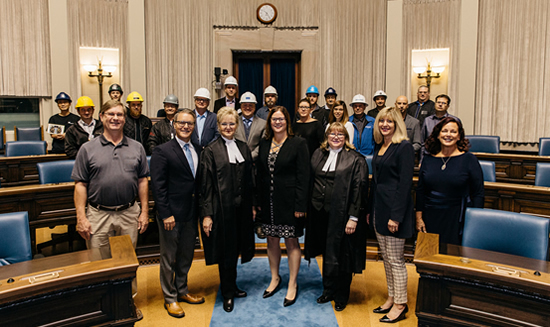 The Speaker thanked the Accessibility Advisory Committee, whose members joined her in the Legislative Building at the official re-opening, as well as all the tradespeople who made the committee’s vision a reality.